12 n Performance & Hotrod Business n April 2015 Motovicity Offers WASPcam Products Motovicity Distribution, a leading automotive performance aftermarket distributor, has announced the addition of WASPcam to its line card. WASPcam (Wide Action Sports Photography Cameras) manufactures a full line of portable cam- eras and accessories for use in action sports such as motor racing, according to the announcement. The cameras are capable of recording resolutions of up to 1080p and have dozens of available attachments for remote mounting just about anywhere. Remote controllers are also available, such as the GIDEON wireless wrist remote that features an LCD screen showing a live feed from the camera, as well as standard wristwatch functions, the company noted. "Motovicity is proud to distribute a high-quality action camera like WASPcam that will capture everything from the time lapse of an engine build to record-setting track times, and everything in between," said Ryan Balicki, sales manager. Available accessories for WASPcam cameras include waterproof diving cases, adhesive anchors, camera tripod adapters, lithium-ion double-capacity battery packs, and more. Furthermore, WASPcam remotes are waterproof up to 196 feet and the cam- eras can be used under water to the same depth with appropriate casings, the company added. Always Evolving Acquires RePlay XD Always Evolving Enterprises LLC has acquired a majority stake in RePlay XD, a manufacturer of professional POV video cameras, for undisclosed amounts of cash and stock. Chris Dolan, AE's co-founder and CEO, will assume executive man- agement responsibilities at RePlay XD, according to an announcement. "Acquiring RePlay XD was an easy decision for me, both because the company's brand and assets are so strong and because of its founder, John Spar," said Dolan. "When I first met him, it was abundantly clear that John was an exceptional engineer with tremendous passion for his products and partners. With AE now behind it, I can honestly say RePlay XD's future looks more exciting than any other camera system out there. I can't wait to share more of our story in the months ahead." Always Evolving Enterprises (AE) is a next-generation digital broad- cast media company for the hyper-connected world, the announcement noted. 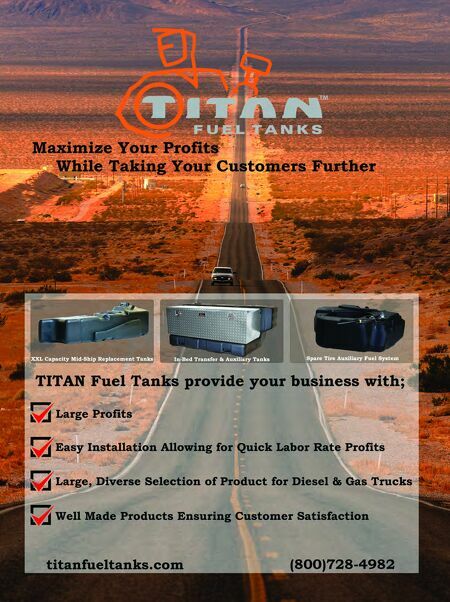 As a lifestyle brand with deep roots in entertainment and motor- sports, Always Evolving developed into a multifaceted provider of hard- ware, software and data infrastructure solutions. "We are thrilled Chris Dolan and AE have chosen to join us in trans- forming RePlay XD into the most capable action media and technology company available for next-generation camera buyers and video produc- ers," Spar said. "Chris and AE envision a world where seamlessly captur- ing and sharing life's most important moments is something everyone does and we can't wait to advance RePlay XD's place in that world." 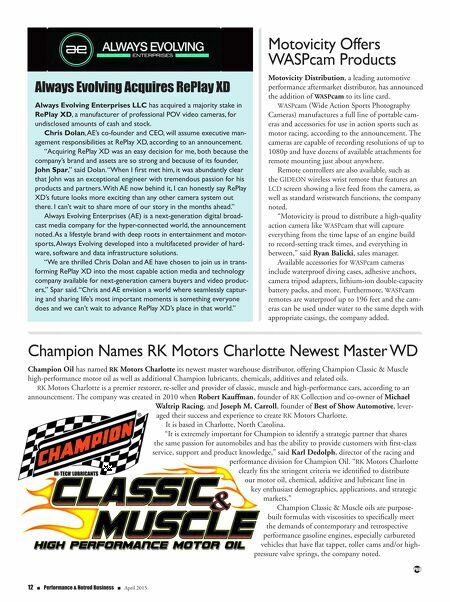 Champion Names RK Motors Charlotte Newest Master WD Champion Oil has named RK Motors Charlotte its newest master warehouse distributor, offering Champion Classic & Muscle high-performance motor oil as well as additional Champion lubricants, chemicals, additives and related oils. RK Motors Charlotte is a premier restorer, re-seller and provider of classic, muscle and high-performance cars, according to an announcement. The company was created in 2010 when Robert Kauffman, founder of RK Collection and co-owner of Michael Waltrip Racing, and Joseph M. Carroll, founder of Best of Show Automotive, lever- aged their success and experience to create RK Motors Charlotte. It is based in Charlotte, North Carolina. "It is extremely important for Champion to identify a strategic partner that shares the same passion for automobiles and has the ability to provide customers with first-class service, support and product knowledge," said Karl Dedolph, director of the racing and performance division for Champion Oil. "RK Motors Charlotte clearly fits the stringent criteria we identified to distribute our motor oil, chemical, additive and lubricant line in key enthusiast demographics, applications, and strategic markets." Champion Classic & Muscle oils are purpose- built formulas with viscosities to specifically meet the demands of contemporary and retrospective performance gasoline engines, especially carbureted vehicles that have flat tappet, roller cams and/or high- pressure valve springs, the company noted.